When people talk about the places they’ve been one of the main topics that comes up is food (though maybe this isn’t just when talking about travel, or is that just me and my friends?!). Every place has different types of food, some good, some amazing and sometimes, unluckily, some awful! But today I want to talk about one of my favourite restaurants, and luckily for me it’s in the city I live in! 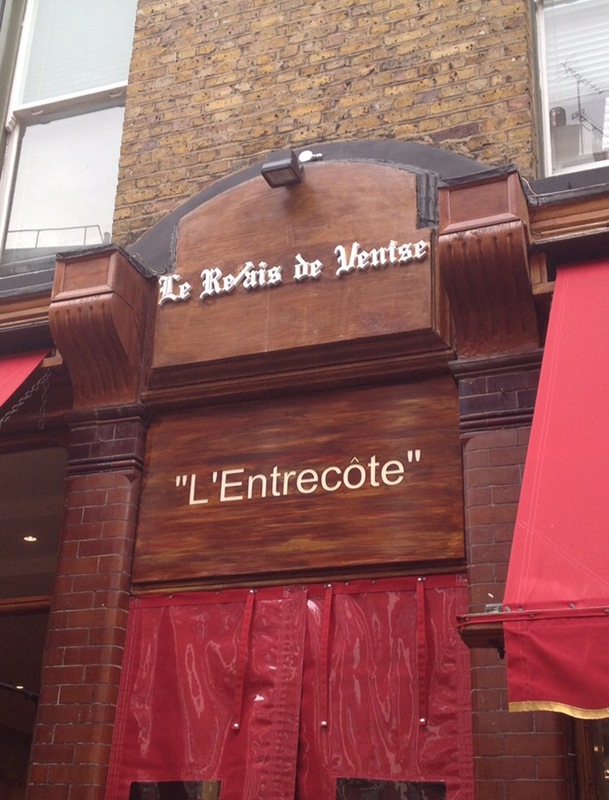 Le Relais de Venise, more commonly known as ‘Entrecôte’, is a French restaurant originally founded in Paris and that now has restaurants in New York City, Mexico City and 3 in London – Canary Wharf, Soho and Marylebone. The only one I have visited is the one in Marylebone and I absolutely love it! The restaurant is not the biggest you’ve seen but they have made the best use of the space they have as there are plenty of tables! The restaurant is open everyday for lunch and dinner, closing for a few hours in between, and there is a reason for that! The restaurant doesn’t take bookings because of it’s popularity – find yourself there on a Saturday night and you’re in for a long wait! To be fair, most of the time when you go there you will need to wait in line fore a table. But the staff are very efficient and make sure everything is running smoothly despite the busyness – hence the need for a break between lunch and dinner! I have found that the best time to go is at lunchtime, around the time it opens. You can normally walk straight in and get a table. The menu is simple. In fact, it doesn’t really exist! This helps with the effiency. If you are to go there you have to like steak as that is all that is on offer! When you get to your table you are asked how you would like your steak. This is how good the place is – I am one of those people that has to have my steak well done, with not a drop of blood (I know, it’s not the way to appreciate steak!) but this is the only place where I will eat my steak medium. And it’s delicious! Anyway, back to how the restaurant works. So you let the waitress know how you like your steak. They will then serve you with your starter – a salad with walnuts and one of the best dressings I have ever tasted. Once you have finished your starter you get your first plate of steak and chips. They will have it all portioned out on their trays and will go around your table giving everyone the same amount of steak cooked how you like. 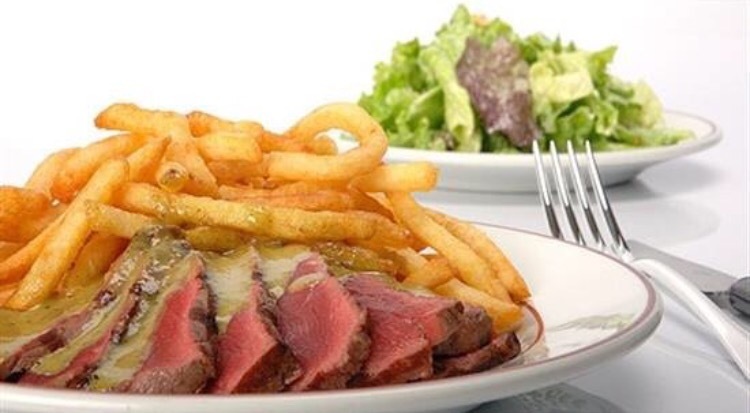 You get a serving of steak with french fry like chips and on top they pour this luscious green sauce – the ingredients of which are a secret! As you come to the end of your serving they come around with portion number two! And that is the menu. Simple yet delicious. I’m not a wine drinker but the red wine there is worth having with your meal. And if you are still hungry afterwards (unlikely!) they do offer a selection of desserts – I think I’ve only had dessert once there, it was good though (I had the profiteroles). This restaurant is worth the money you pay (around £25 not including drinks) and worth a visit if you are in London. I crave the meat there and personally haven’t found a better steak. Though the restaurant is efficient at getting people in and out you never feel rushed and it’s always been very welcoming. I think I’ve made my mouth water a little bit, I could do with some steak and chips now!